For decades it had lurked in the depths of the lake, growing bigger by the week. Then the carnivorous monster took a fancy to the mackerel strip 14-year-old Will Sudders was using as a bait. At 5am the schoolboy was woken in his tent beside by the water’s edge when the electronic bite alarm on his rod began beeping and an epic struggle ensued during which the fish almost wrenched the rod from his hands. 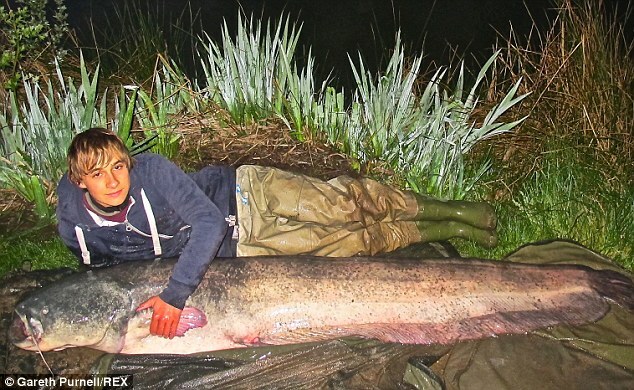 After 45 minutes, the 5ft 4in tall schoolboy finally landed the 7ft long Wels catfish – and a place for himself in the record books. His impressive catch weighed 8st 10lb making it the biggest freshwater fish caught by a junior angler in Britain – and probably the country’s biggest living freshwater fish. As it was also more than a stone heavier him, having reeled it in by himself Will, who weighs 7st 7lb, needed help from his uncle Graham, 60, to drag it out of the lake and onto the bank. 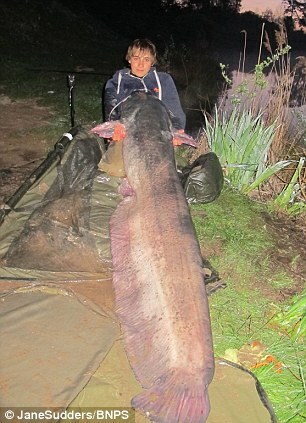 In time-honoured tradition, the teenager then had his photograph taken alongside the gigantic specimen before weighing it and throwing it back into five-acre Oakwood Park Lake in Thetford, Norfolk. Will, of Colchester, Essex, said: ‘After two days of only catching carp suddenly my rod alarm went off and my reel started screaming. ‘I struck into the fish and immediately the rod bent forward and was almost ripped from my hands. I knew that I had hooked one of the big catfish in the lake. Experts verified the record status of the April 17 catch, which was declared a ‘hot news exclusive’ on the front page of the magazine’s latest edition. Will took up fishing four years with a £5 rod his mother bought him from Argos, but now has all the latest high-tech equipment. Incredibly, it is not the biggest fish he has ever caught – as he landed a 12st 7lb albino catfish from the River Ebro in Spain in 2012. 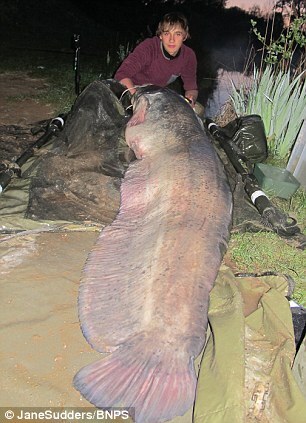 But it is more than twice the size of the biggest catfish he had previously caught in Britain, so came as a big surprise. ‘It has really made my year and we are only in the spring,’ said Will. The biggest catfish ever caught in Britain weighed 10st 4lb and was landed by chef James Jones in Essex in 2012, but that fish has since died. Catfish records were suspended by the British Records Fish Committee in 2000 because they are a non-native species. At the time the record was 4st 6lb. Some large catfish in Oakwood Park Lake have been caught several times by fishermen over the years and can be identified by scars on their bodies. 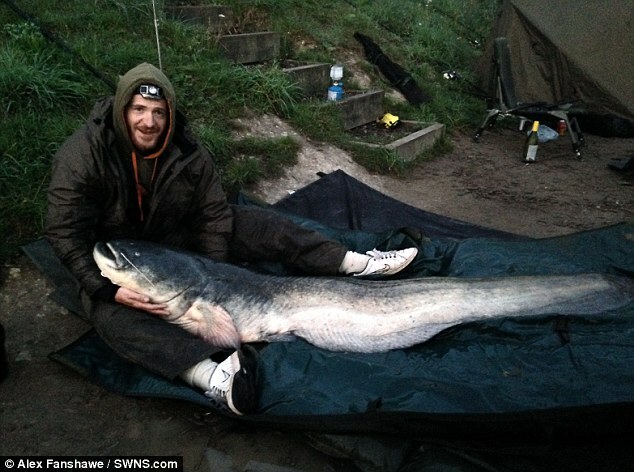 Among those is one nicknamed ‘The Duke’, which weighs 8st 7lb and was caught most recently by Alex Fanshawe, 32, a disc jockey, of Ruislip, north-west London, on Saturday. ‘The Duke’ was thought to be the biggest fish in the lake until Will’s catch. The lake’s owners Kate and Gideon Dyson today confirmed that the fish Will caught was not ‘The Duke’.